Wednesday, Sept. 5, 1888 About as cool but quite pleasant. As well with Ellery think, & at usual duties as of late, spending most of day at store, where he took his dinner, but with me took supper at Mr Wedgwood's & where I took dinner as of late, stopping awhile after, but spending most of time at home, busy with usual chores as of late, with time for rest & some reading. Thursday 6 Cool & breezey, but quite pleasant. Ellery up in good season, & with Mr Wddgwood's horse & carriage off for Postville soon after 8 o.c. returning before 5 o.c. 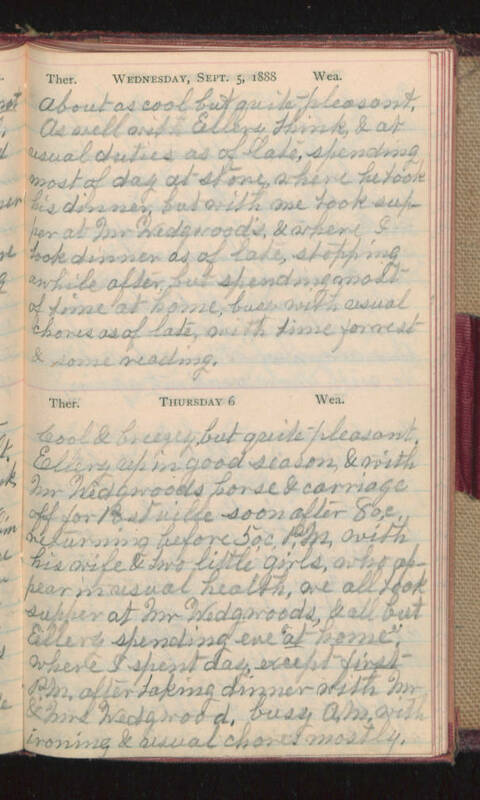 P.M. with his wife & two little girls, who appear in usual health, we all took supper at Mr Wedgwoods, & all but Ellery spending eve "at home", where I spent day, except first P.M. after taking dinner with Mr & Mrs Wedgwood, busy A.M. with ironing & usual chores mostly.